FORS has launched the latest addition to its series of toolkits. Forming part of the FORS Professional training portfolio, the new ‘Bridge Smart, Prevention of Bridge Strikes Toolkit’ is devised exclusively for FORS members and includes guidance for managers and drivers. The ‘Bridge Smart, Prevention of Bridge Strikes Toolkit’ comprises three essential themes; ‘Reset’ the culture of preventing bridge strikes; helping members to ‘relearn’ avoidance techniques and raising awareness through education and training, and; ‘regain’ industry best practice to prevent bridge strikes. Delivered through two platforms, the toolkit is accessible as an online eLearning module through FORS members’ own dedicated eLearning dashboard, or via group delivery if individual online accessibility is not possible. The ‘Bridge Smart, Prevention of Bridge Strikes Toolkit‘ provides detailed, yet easy-to-digest, practical measures on reducing incidences of bridge strikes, while at the same time offering procedural advice should a bridge-related incident occur. Toolkit guidance exists for improving driver knowledge, to provide examples of best practice and for internal communications resources. The toolkit is part of a series of FORS toolkits covering all aspects of safety, efficiency and environmental protection and is available as an eLearning module. 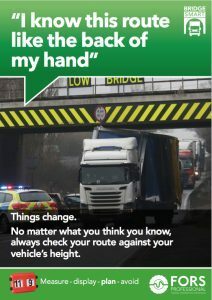 As with many other FORS Professional eLearning modules, the ‘Bridge Smart, Prevention of Bridge Strikes Toolkit’ is designed as a short, interactive training module aimed at HGV driving staff, but with benefits for transport managers and supervisors. “Bridge strikes can cause chaos,” said Graham Holder, FORS Head of Quality Assurance and Compliance, “and yet they are entirely avoidable. They result in huge costs to industry, reputational damage for operators concerned and huge frustrations for other road users.